A subpoena is usually a formal request for documents and/or appearance, typically requested by an attorney in the course of litigation, or by a government agency in the course of a criminal or civil investigation. What should I do when I receive a subpoena? What is the underlying litigation about? Do you have direct or other knowledge about what the issues are in the litigation? What is the subpoena asking you to do? Is it requesting that you provide testimony, documents, or both? Does the subpoena excuse you from testifying if you provide the documents in advance? Are you in possession of the information listed? Review the subpoena and consider whether your firm is in possession of the information. If the information is confidential, such as tax documents, it may be subject to claims of privilege by the client and/or an accountant-client privilege. Does the subpoena provide a deadline for complying? If the deadline is quickly approaching, or if the subpoenaing party did not provide sufficient time to comply, have you received any communications to suggest the opposing party will grant an extension of time? What communications have you had with your client? Have you had any contact with your client, the attorneys on the case, or the governmental agency? Does that contact suggest whether you are a target or merely a person in possession of information? Is the client taking specific measures to formally object to the subpoena? Why am I receiving this subpoena? Typically, an attorney or other party will issue a subpoena because he or she believes you are in possession of information and documents that will establish facts that are relevant to the underlying case. However, sometimes a subpoena may indicate you are a target in the underlying case by seeking information that could implicate you as possibly liable for the matter being investigated or litigated. Am I required to comply with a subpoena? Is this subpoena a court order? If you have received a subpoena that is signed by a judge or from the government, you must comply. Government subpoenas generally must be complied with even without client consent or a court order. However, most subpoenas are pre-printed forms that attorneys or other parties fill out to request information. 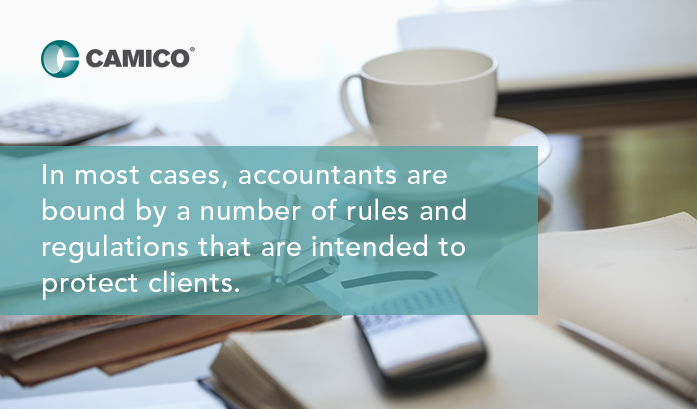 In these cases, accountants are bound by a number of rules and regulations that are intended to protect clients, including Internal Revenue Code section 7216. Under certain circumstances, these rules and regulations prohibit the accountant from complying with the subpoena, unless the accountant has undertaken specific measures to protect client confidentiality. Again, contact your risk adviser regarding all subpoenas to evaluate the underlying litigation and the obligation to comply. Should I report this subpoena to my professional liability agent or carrier? Yes, regardless of how much or how little information you may have pertaining to the client or former client, it is always important to promptly report the matter. The information provided is a general overview and not intended to be a complete description of all applicable terms and conditions of coverage. Actual coverages and risk management services and resources may vary and are subject to policy provisions as issued. Coverage and risk management services may vary and are provided by CAMICO and/or through its partners and subsidiaries. Copyright © CAMICO. All rights reserved.